Nelson Piquet once said that competing in the Monaco Grand Prix was like riding a bicycle round your bathroom. Riding a motorcycle in central London is like riding a bicycle in your bathroom but there are ten other cyclists, marksmen standing in the bath, the floor is full of potholes and every now and again a bus drives through the middle of it. London traffic is absolutely, dreadfully awful. London roads weren't designed, they evolved from an ancient pattern of cart tracks into the world's most stupid road layout. To be a vastly competent rider. To know how to use your bike's controls without even thinking about it - all your brain power will be used to read the conditions ahead, to the side and behind. To be a fast and good decision maker. You make decisions in a split second and if you get it wrong you could get squashed between a bus and an HGV. To be a confident rider. You decide, you act. If you hesitate someone will block you or you will get knocked off your motorcycle. To be fearless. Timidity is not a great attribute when the gap you thought you could squeeze through is closed 0.5 seconds before you arrive at it. You simply react accordingly without fear and move on to the next thing without thought. To be a good all round observer. To be able to know what is in the 360° zone around you. To throw away everything you thought you knew about the rules of the road and be prepared to learn new ones. And if you possess all the above attributes you will still be a useless newbie in London traffic the first time you ride through it. There are two sets of road rules in England - those inside and those outside the M25. You will not find courtesy, politeness or calmness in London. You will find aggression and drivers who care nothing about you. After all that why would you even bother riding a motorcycle in London? For me there are three reasons. 1) Because driving takes an absolute age and there is nowhere to park, 2) Because biking is infinitely faster, cheaper, more pleasant and satisfying than using public transport, 3) Because it's massively exhilarating. I absolutely love the nip, tuck, rush and constant barrage of dangers thrown at me whilst I thread my way through London traffic. It constantly tests my skills and exercises my brain. You get to your destination with a feeling of elation that you are alive, and didn't have to sit next to the smelly person on the tube. Now down to the nitty gritty. 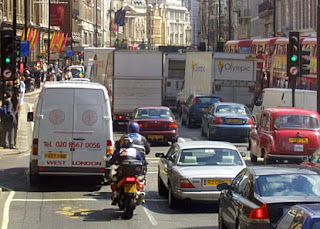 You enter London and see the traffic is quite different to that in most places. It is a mix of normal cars, scooters, taxis, vans, private hire people carriers, HGVs, buses and coaches. You have to consider that all of these are deranged psychopaths, but that anything with Addison Lee written on the side is a deranged psychopath who's next intended victim is you, and they are texting their friend to tell them this. The safest way to start is by entering London on the M4. It is a real motorway with three lanes. At some point it becomes two lanes. It is at this point the London experience starts. Drivers will move over suddenly (and without indicating) with no regard for you or anyone else. They will jostle with each other and they will shuffle forwards in jerky movements until three lanes becomes a grumpy, grumbling two. Your job is to weave in and out of this morass of metal in a such a way that you touch nothing but lose as little speed as possible. You need to be able to judge distances between vehicles, both stationary and on the move. You need to know how wide the gap will be when you arrive at it. You need to know how wide the widest part of your bike is, typically the mirrors, to the millimetre and in a millisecond calculate if it will fit through a gap, that will possibly be smaller when you arrive than it is when you first see it. After the M4 has turned into the A4 it then becomes three lanes again - but three really narrow lanes. As the cars slow down you need to filter - overtake, undertake, and use whatever tactics you can to find space, be it between lanes 1 and 2, between 2 and 3 or on the inside or outside. Like I said before, normal rules do not apply. You will weave in and out, moving and observing. You need to look as far ahead as possible. You need to know when the traffic lights half a mile ahead are going to change. You need to know what that car two cars ahead is going to do and when. You need to know if that vast coach to your left will stay where it is or move towards you. Coaches are the ocean liners of London - huge, slow, dim-witted and unstoppable. You need to not be in a position where you could get crushed. Never sit between a car and a bus, coach or lorry. Always see an escape route and use it. As the traffic moves sometimes you sit in the middle lane and hang back a little so you can judge if it is best to go between lanes 1 and 2 or 2 and 3. Whatever has the least amount of large vehicles with sharp, pointy bits is best. But then be prepared to move across and through the other traffic into another space if that will let you move forwards faster. At this point you will notice other motorcycles. They will not behave as they would outside the M25. They will not wave or nod. They will either block you by refusing to move through that gap you know they can fit through, or they will be in your mirrors getting annoyed that you have not moved fast enough. As you move across the lanes you must always check over your shoulder for a biker coming from between the lanes of traffic. Some of them (us) move faster than you think. 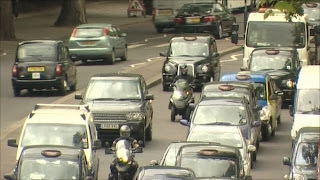 The further into London you go the more the road splits from two to three lanes and back again, the more junctions, traffic lights and bizarre roundabouts you will encounter. You will also find pedestrians in strange and unusual places. They dawdle in a daze with their iPods on and will suddenly appear from behind vans. They are soft and squishy and you are hard metal. If you hit them the law will say it is your fault and you will probably go to prison. Your observation and anticipation must be heightened and your reactions must be lighting fast. You must be able to stop your motorcycle in an instant without locking a wheel and falling off (if you do someone will run over you). In order to use as much brain power as possible on riding you should use a bike mounted satnav so you don't get in a fluster about directions. London's road layout is so insanely disorganised and downright weird that someone new to the capital's streets can get very easily confused. A good way to improve your skills is to try and follow the couriers. That's how I learned. Weave in and out. Try to never stop but rather find that gap, keep moving, turn in and out, judge gaps at speed, use whatever space is available. Feather the throttle, use the clutch, apply the brakes confidently. Be quick, be smooth and never stay in one place too long. Don't let trouble and danger find you. Identify where it might be and get out of that place as soon as possible. You can use almost all bus lanes in London. But so can taxis, buses and diplomatic vehicles. All of these will move in and out of the bus lane at speed, will often stop with no warning and will open doors in your path. When in a long line of traffic weave in and out of the other vehicles to make sure you get to the front, moving from lane to lane if necessary. Understand how tightly your bike can turn. Do everything possible to get to the front. If someone is needlessly blocking your way either beep your horn at them or rev your engine. If they do not move they must be considered dangerous either because they are angry that you are going faster than them or because they have not noticed you. You should get as far away from this sort as possible. I enjoy riding in London but wouldn't do it purely for fun. There are so many ways for you to die or be injured. You have to be on constant high alert and be prepared to act accordingly. Very, very occasionally someone will see you coming and move over slightly to allow you to pass. Be a good rider and acknowledge their deed with a nod or wave. Finally - once you have left the Metropolis you must remember where you are. The police and other road users are tolerant of you riding in a fashion that would be considered idiotic and illegal elsewhere, because everybody does it. If you try the same moves in your local town centre the police will spot you or a driver may take umbrage and try to enact revenge in frustration that you represent everything he wants but doesn't have - freedom, fun and enjoyment.